First let me just gush a bit… This reading program was fun, Fun, FUN! Jeremiah, our 4 year old, loves to be grown up and do “stool” (school) like his brothers and sister; He gets even more excited when it is some “stool” of his very own. Reading Eggs is an interactive reading program for children, that starts as young as 3 and grows with them through the age of 13. Jeremiah used the very beginning level and loved every minute of it! I loved that it was intuitive for him to use and needed very little monitoring from mom to complete the tasks. It fostered a great sense of independence for him. I would often use the time he was enthralled with his schoolwork to do a little more in-depth working with his older brother. It created a perfect time window to provide one on one attention and work on pesky little things like Grammar or Math…. subjects that need a little more attention. 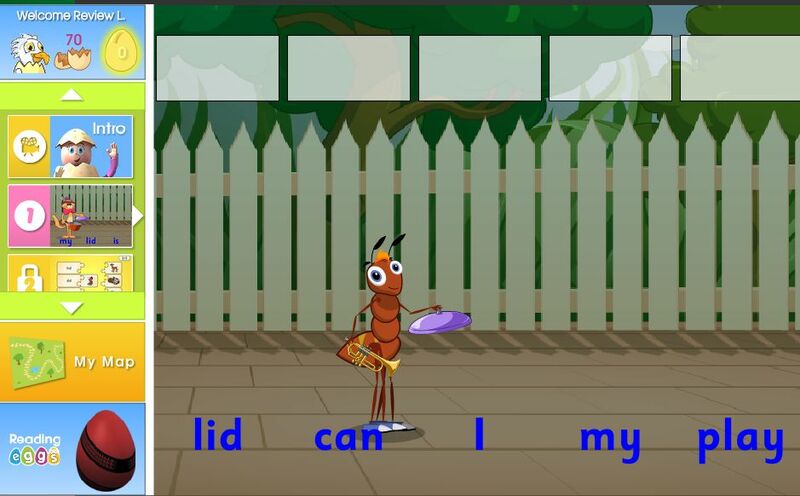 It teaches with a unique blend of Letter/Sound Recognition and Sight Words. Each lesson is comprised of about 12 shorter lessons, all building on the lessons before, reinforcing the letters, sounds and words used before. In the example above, a child would be asked to put the words in the correct order to create a sentence. This is something I thought that Jeremiah might struggle with…. but with the younger students they call out each word, in the proper sentence order, focusing on word recognition. One thing that I did notice that Jeremiah would do, that I really didn’t like. He would memorize the shape of the word and when called upon to match it, he would match based on the letter shapes and not really READ the word. This happened about half of the time, and really depended on the game that he was playing. This is one of the reasons that I do not like teaching with sight words exclusively…. If I noticed that he was doing this we would just make sure he was sounding out the words and not just guessing them. 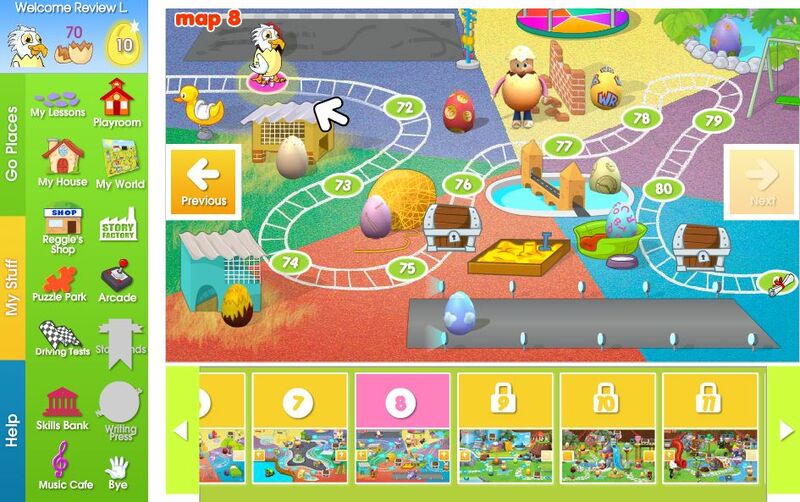 Children navigate through the lessons by completing a series of Maps. Each Map is made up of 10 lessons. Lesson 11 is a quiz. You must pass all the lessons to advance to a new map. Typically Jeremiah will sit down and do 3-5 lessons in a day. Completion of quizzes earns you a certificate of completion based on how many you answered correctly. There are no pictures to match on the quiz, they must listen and choose the correct word or letter. In our house, certificates are displayed proudly on the wall between the kitchen and the living room, for all to see. Subscriptions are available yearly for $75.00, every 6 months for $49.95, and at a monthly level for $9.95. Reading eggs does offer multiple child discounts. While the pricing isn’t bad, it is not something that our family can afford at this time. If we are in a position to have an income that will allow for us to purchase this, we will most definitely do so! Reading Eggs offers assessment test placement for each student, to assure they begin at just the right level for them. We knew we were at the absolute beginning so we just started there, without using the assessment. I know the program works. Jeremiah recognizes the words from the first 3 Maps in print books, and in signs around town. The gift of reading is priceless and I would like to give a big thank you to the creators of this program for sharing it with TOS Homeschool Crew Members this year. See what other crew members are saying by visiting the Homeschool Crew Blog. As a TOS Homeschool Crew Member, I was given access to Reading Eggs for a trial period of 3 months. This extended trial period was for the express purpose of creating this review. No other compensation has been received. I am not required to furnish a positive review. This was our family’s second opportunity to review Kinderbach, an amazing way to learn Piano at home. We really just have a great time learning piano this way. Our primary reviewer was Jeremiah, he is Four and a perfect fit for Kinderbach’s target market of 2-7 year olds. This is the most gradual learning product I have ever seen marketed. It is broken down in easy to understand video lessons that are great at keeping the attention of young ones. It slowly builds on the previous lessons until there is mastery of the notes and the different rhythms of each type of note. It does more than teach piano, it teaches music. and he uses his body to clap, stretch, stomp, and wiggle to the different rhythms of the notes. My older son also finds the names of the Notes being taught as characters, help him remember where they are, as he practices his more traditional piano lessons. The one thing we found hard to do was, play along on the piano with the lesson. Our family computer is a desk top and the piano is in the next room. Last year we had a laptop, and it was easier to just hook that up wirelessly in the next room. I think that this program would be a great investment for a homeschool co-op. It would be a wonderful way to create a class for all the younger siblings to attend while their brothers and sisters learn other subjects. I am excited to tell you that Kinderbach is making their product available on multiple mobile devices. Lesson one is fully compatible with the iPad. It makes me wish I had an iPad so I could have used it! 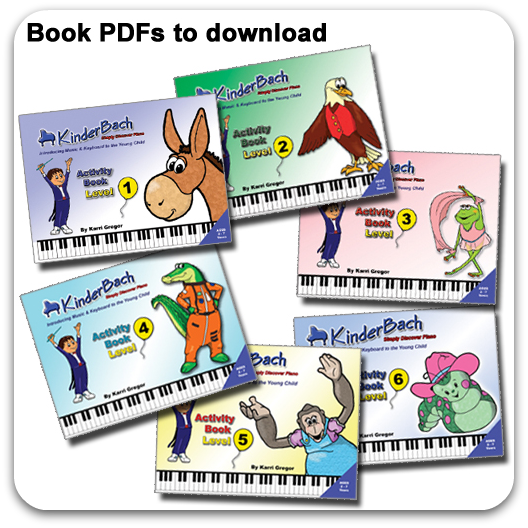 Kinderbach is very affordably priced at $20.00 a month for all 7 levels of their music curriculum. Visit their website to learn more about their DVD product and their yearly pricing for home use and for school use. Make sure you check out the other reviews at the TOS Homeschool Crew Blog and see how other families used and enjoyed this product. I must tell you that this product was so much more fun than I anticipated! It is a great way to begin to teach your child words in a fun and engaging way. I feel it only fair to explain that I am not a fan of sight words. I really am more of a phonics based mom. For this reason I wasn’t too sure how this Sight Word based game was going to work. I want my child to have the skills to de-code words that they come across and I feel like phonics is the way to teach that. That being said, I also have one child out of 4 (Hunter) that has struggled with phonics, not the saying or remembering of the sounds, but with the “seeing” of those combinations within a word. That child led me to search out lists of commonly used words in the English Language, to begin reading each day so that he could have a few “tools” in his pocket for reading. Because of Hunter and his struggles, I hope Jeremiah will benefit from a more rounded approach. I better understand how the two philosophies, sight words and phonics, can work together to help a child read. I don’t think sight words should be used exclusively to teach reading, I have begun to see how they can assist phonics learning if used properly. Jeremiah, our chief product tester for this review, had no previous word recognition besides his own name and those of our family. We started right at the beginning with Book 1 the Skunk Book. You learn the words in 5 word groups, progressing through the cards until you have learned all of the words that are contained within each book. I liked the fact that the amount of words that you are learning are a few at a time. Thirty per book and from those 30, only five at a time. This is very manageable for Pre-School aged children. It makes the game fun and quick for them. Jeremiah wanted to read the Skunk Book from the time that he finished his first five words so I would let him “read” the book and pick out all the words that he knew. Every time he found one, the look was the same as that picture up there. Pure Joy. I have let him set the pace with learning his words through this game. We play it nearly everyday and some days it is played more than once. The older kids like playing it with him, so I am not always required to help him each time. I do not move on to a new set of 5 words until he can recognize the 5 we are on with out error for a few days (maybe a week) in a row. He’s 4, we have lots of time. The cards are small and easy to transport, so they make a great travel game. If you know you are going to be waiting for dinner at a restaurant or at the doctors office, throw the 5 cards you are working on in a sandwich bag and toss it in your purse, you are ready to play anywhere. I have forgotten the cards at home, yet, because I only have to remember the 5 we are currently on it was very easy to take a scratch paper and make paper cards to play with while we waited for our dinner to arrive. It kept both the natives from being too restless! If you are looking for a more formal approach to assessments, The Reading Game website has free printable assessment sheets for you to test their pre game and post game recognition skills on each of the 180 words the program uses. The game uses 54% the Pre-K, K, and 1st grade words on the Dolch Sight Words List. It concentrates on the words that are not easy to learn through picture cues. I would not box myself in with thinking that this game should only be used with children 4-8 years old. 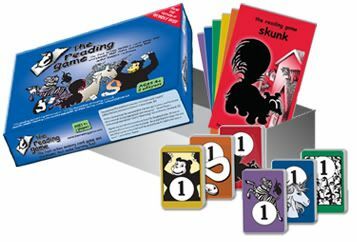 I really think that anyone, young or old that needs to learn how to read or needs some reinforcement in reading would benefit from this product. Priced at $24.95 it is affordable, especially for families with multiple children and teachers who would use it in a more traditional classroom setting. This family gives The Reading Game two thumbs up! Please take the time to read what other families are saying about this product. You can find more reviews at the TOS Homeschool Crew page. ***disclaimer*** I received The Reading Game, free of charge for the purpose of this review. No other compensation has been received. Thank you to the creators of the game for your generosity in providing your product to the TOS Homeschool Crew to review. All of the above opinions are my own. Sometimes a Not Dinner for him will be left over chicken pulled into small pieces, a cheese stick a few crackers, and a banana. Sometimes a Not Dinner is just separating out the food we are eating that night in the form of a casserole, but keeping his as individual items… a pile of rice, a pile of broccoli, a pile of cheese, and the sauce to dip it in. We have found that giving him a little bit of control over HOW he eats what we tell him he must…. keeps meal time meltdowns to a minimum. So the other day I was washing the dishes and amidst the boredom an idea struck, I am happy to report it was a cute idea, and when I got to doing it, more cute ideas kept springing up…. and since I was feeling so creative, and it actually worked out the way I planned (not something that happens often…lol) I thought I would share my morning of fun with you. I was thinking about decorating for fall. I am not a big seasonal decorator, but I found myself yearning for I could make with the kids and hang up around the house. Something easy, cheap and not too messy. I decided to make my own window decorations with items that I had around the house. Cut a strip of Wax Paper off the roll that is about 12 inches long. You should be able to get about three leaves on a page. We chose to use fall colored crayons and making sure to toss in some brown and green for visual appeal. Little fingers are made to sharpen crayons, so I set Jeremiah to the task. He just picked random colors and shaved away. When we felt we had collected enough shavings, we spread them on the waxed paper and folded it shut. Now for the fun part…. and the part where the *GROWN UP* gets in on the action. Use your Heat Tool to melt the wax shavings in the paper. don’t get to close or it will start to “smoke”. No I won’t explain how I know that. It helps to have a piece of Newspaper under the wax paper, because it is possible for the colored wax to leak through. There are no photos of this particular part because working the camera, and the heat tool, need to remain independent operations. ‘nuff said. If you are using a clothes iron, sandwich the wax paper between a few sheets of newspaper. Make sure the iron is set to LOW and that the steam is turned OFF. Gently rub the warm iron over the newspaper until the wax shavings have melted. here is what it should begin look like as you are melting. let the wax paper cool COMPLETELY before you cut out the shapes. Throw some tape on the backs of them, and hang them on the window. They look amazing when the light shines through them. If you are feeling artsy…. and I was as I kept making leaves……. You could try your hand at making pumpkins… or apples…. You could even use them to decorate for Thanksgiving. Aren’t these the cutest name holders you have ever seen? Just cut out the leaves or make mini pumpkins and use your scrabble holders to spell your guest’s name. This family of 6 is heavy laden with testosterone filled boys. Boys who love to cook. I’m not kidding. My younger boys love to cook. Their love of cooking is why I knew they would love this great kitchen from Guidecraft. They would be able to play and create endless imaginary dishes and I might actually get some work done in the real kitchen! Now don’t get me wrong…. it wasn’t just imaginative play where they were pretending to be the Doogie Howsers of the Culinary World. They fired up those burners and assassinated some evil villains and space aliens too, melting them in a potion of liquid hot death…. That is the beauty of imaginative play. Minds creating, unleashed, full of endless possibilities. The boys (ages 4 and 9) absolutely loved this Kitchen. It’s claims to foster imaginative play were delivered on 1000%. It will provide hours of fun in the cold snowy months to come. Since the family is made up of more than one…. and more than one person is involved in the review process…. we need to take the time to hear from Daddy the assembler, and mommy the chief financial officer and see how they weigh in on the Guidecraft, Hideaway Country Kitchen. 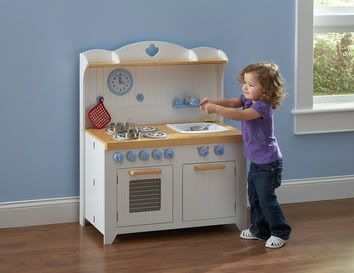 While the Kitchen itself is created for use by those ages 3 and up, the words “some adult assembly required” should come with a disclaimer. It should read, “structural engineers please apply”. The directions are only pictures, and they are not the clearest of explanations. Daddy is a MacGyver and made it work…. but many of the components did not fit together as designed. Here is a picture (drawn on an envelope) where he shows how the holes in piece “A” did not properly align with holes “I” and “J” and the screws had to be put in at an angle. Also contained in this rendition, he shows on piece “A” the need for a deeper dado so the piece containing the clock could slide in properly. One part was, out of the box, broken. The glue was not attached and it just separated as soon as you closed the oven or dishwasher doors. Don’t worry though. MacGyver fixed it. It won’t move now. As he assembled the product he kept a list of notes (he is such a good reviewer’s helper!) Here are some of his thoughts as he traveled along in the 4 hour process of putting it together. He was disappointed in the over-all craftsmanship, especially the MDF and not “real” wood that it was made out of. He didn’t like that it was manufactured in another country. He thought that no instructions or parts list had been included with the product. After following the one paper that was included with the product, and printing out the directions via the website. He found the directions in the box marked hardware. When he tightened the hinges into the side rails…. anything past finger tight, the MDF started to split. The screws were not of the highest quality, as many of the heads were off-centered. In general, from the wife/photographer position….. He seemed very disappointed with the whole manufacturing and assembly processes. He did say that power tools were pretty much a necessity. I really like the portability of it. It folds easily (hence the name HIDEAWAY) and it was nice to be able to store it in the closet when we didn’t want to have it in the living room or kitchen. The knobs are realistic, but noisy, and those days when you are trying to talk on the phone or work on reading with another child….the words “STOP CLICKING THE KNOBS” have been known to fly from my mouth. It is very cute. I really am a sucker for the bead board look. That alone could win my heart….. I was disappointed with the lack of craftsmanship and flaws that we found during assembly. The quality that is conjured up by the mere mention of Guidecraft toys didn’t seem to follow in both arrival condition and into the assembly process of this particular product. Pieces were marred and scratched, and the laminate chipped even before my two energetic boys ever laid a hand on it. Even with the flaws. The boys don’t care…. they love it. They have made meals for “The Hulk”, played restaurant, and alternated between server and cook. Their imaginations are running wild and growing with each day. Priced at $200.00, I would guess this places the Hideaway Country Kitchen out of the reach of many two income families, not to mention those that homeschool and tend to live on a very tight budget (like mine). That being said, it is still priced low enough that with forethought and budgeting, a family could save for the product, hopefully it would be in better condition than ours was, and they could enjoy it for many years. The company does state on their IN-BOX literature to please contact the retailer or place of purchase in the event that you need a refund or exchange. It is very clear that they intend to stand behind their product, and assure that customers are satisfied with their purchase. ALWAYS a great thing to find in a company! They also offer a very WIDE range of products please visit their website to see if there is something there to spark the fires of imagination for your children. For this family, it would likely not be something we would have sought out to purchase on our own for use at the house. I have thought of purchasing one for the Nursery at church, and still struggled with spending $200.00 for a toy. Please don’t just take this family’s word for it. 25 other families reviewed this product. Please take the time to read their reviews on the TOS Homeschool Crew page and take them into consideration before you form an opinion about this product. Ever get something…. and the more you read it, you say to yourself…. Yes. Yes! YES! This exactly what I have been looking for!! That was my experience after receiving and reading Before Five in a Row. I kept reading and reading, becoming more excited with each turn of the page. I almost wanted to hug the book! It was exactly everything I wanted Pre-School to be. Relaxed. Delightful. Inquisitive. Fun. Before Five in a Row is designed for children ages 2-4. It takes great children’s literature and weaves activities built on each book, into your everyday activities. When my now High School children were in Kindergarten, they had a teacher who was amazing. I remember sitting in the back of the class, watching in wonder at all the activities she could squeeze out of a book. It is something I knew they had to teach you in teacher’s school, and it was something I longed to recreate in my own home, but was never quite creative enough to pull it off. Fast forward 12 years and 2 more kids later and I was blessed with this great book. It was the most amazing “AH-HA!” moment for me. I suddenly had the perfect tool to squeeze great fun out of a book. Jeremiah, age 4, was my primary helper in experiencing this product. I dare say he loved the fact that we set aside time to read and play a couple of times a week. The next book we explored was Blueberries for Sal by Robert McCloskey. This book came along the week we were learning about the letter ‘B’. Pretty neat huh? Cuz’ I am the mom I can schedule neat stuff like that… . The bonus part of the deal was that blueberries were on sale at the Farmer’s Market so we had a flat of our very own berries to play with. We ate them while we read. We added them and subtracted them while we ate them. We talked about bears, and mountains and bushes. Mommy drooled over Sal’s mom’s kitchen stove….but that had nothing to do with the fun we had with this book. 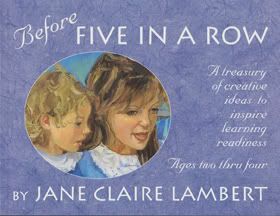 In addition to being a book that offers lots of interesting ideas to help bring literature alive by nurturing the innate curiosity of little ones, Before Five in a Row has an amazing Part Two, to the book. I like to think of it as the Teacher’s Manual to early childhood learning. It is crammed full of ideas that will help your child learn through creative, yet mildly directed, play. Ideas for Poetry, Music, Large and Fine Motor Skills. How to incorporate learning into a trip to the Store…. and so much more. If you would like your very own copy of this book. It can be found exclusively offered at Rainbow Resources. The cost is $35.00 and for the many years you will use this book, I find the price to be quite fair. Just in case you are worried about finding all of the 24 books that are listed within Before Five in a Row, I can assure you that they shouldn’t be hard to find. I was able to find the majority of them at my local library for no cost at all. If you would like to purchase these books for your own home library, here is a reasonably priced list. Visit the Five in a Row website to see the great products that they offer for older children in their Five in a Row, and Beyond Five in a Row curriculums. 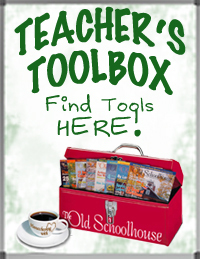 Never take just my word for a homeschool product that you see on my blog. Many families spend time with these products. Stop by The Old Schoolhouse Review Crew blog and see how this product worked or didn’t work, for them. See you soon! Happy Schooling! We were given a copy of Before Five in a Row, free of charge, in exchange for an honest review. No other compensation has been received. I am under no obligation to love their product, or gush about it endlessly. It has been played nearly everyday since. When they wake up in the morning, I hear “Mom, tan we pweeze pway fwee sur-tus?” from my 4 year old. The 8 year old begs too, he just doesn’t have quite the endearing lisp the little guy does. The rules are easy to follow, and game play is quick. This is a great thing to consider when you are playing games with the elementary set. It only takes about 20 minutes to play from start to finish. It is a very engaging game. Who can play? ~ It was created for children ages 6 and up, but my 4 year old, and our 5 year old friend, had NO trouble playing and keeping up with the game. Moms, Dads, Grandpas and Grandmas, don’t be afraid to join right it! Where can I find it? ~ Click to find a store locator near you or buy directly from the R&R website. Cost? ~ $15.95 from the R & R Games website. The object of the game ~ The Flea Circus has come to town and all the cats and dogs have come to watch all the clowns, acrobats and jugglers. Your job is to play your flea cards right and collect the most cats and dogs… but beware of the Dog Catcher !! Our family recommends this game to families everywhere and not just those with elementary aged children. ( I won’t embarrass my High School kids and tell you how much they liked the game ) It was a great game to play with a few neighborhood friends or when your cousins come to visit. It would even be great game to take on a trip; the box is small enough to fit in luggage and the game could be played easily on a hotel room bed. To see what other reviewers have to say about this product and many more visit the TOS Homeschool Crew page. Don’t forget to stop by the R & R Games site to see what other great games they offer! They are so sure you will like one or two of them that they are offering a 20% discount code good for any purchase from their website until 12/31/11. Use code: CREW20 at checkout. 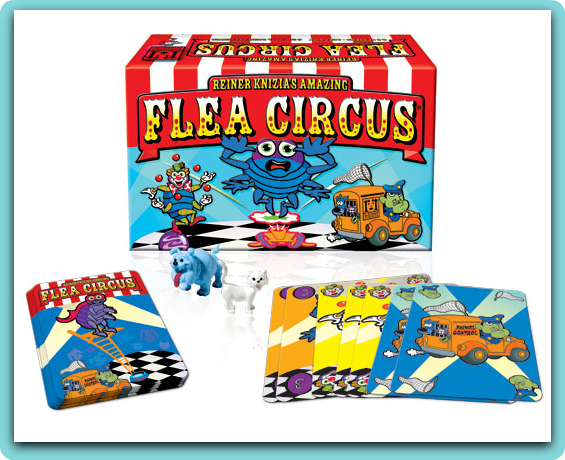 I received the game Flea Circus! from R & R Games free of charge. R & R furnished this game solely for the purpose of this review to Independent Contractors of the TOS Homeschool Crew Program. No other compensation has been received, and I am under no obligation to furnish a positive review.